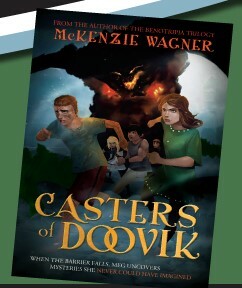 My 10-year-old son, Casey, who loved Benotripia so much, was thrilled to read another book by the same author, called Casters of Doovik. The first thing he said after he was done was “This book needs a sequel!” He had a hard time putting it down. He wanted to keep reading because of how exciting and adventurous it was. It was EVEN BETTER THAN PERCY JACKSON – not surprising, since he also felt the same way about Benotripia. The main characters in Casters of Doovik are Peter, Meg, Eric, Tessa and Dylan, who are all training to be casters. They come together when a magical being casts a spell on the land of Doovik. They set out on a quest to find him. They must reverse his spell within five days, or it will be permanent. These five characters were the only people of Doovik not affected by the spell because they were halflings. You will find as you read the book that this was for a specific purpose. All five main characters have a light that activates when they are in danger. Peter is an outside dwelling thief who can turn himself invisible. Meg, who sells spices with her family, can blast people. Eric always helps his friends, and is very strong. Tessa is the niece of a duchess and can heal others. Finally, Dylan is a clumsy fellow who is skilled with building out of scrap metal. Casey’s favorite character, though, was a man named Oremus, who helped the five halflings discover their powers. He prepared them to fight and take on their duties as casters. Some good lessons to learn from this book are to not judge people, and to help people instead of turning away from them due to man-made barriers. Casey recommends this book to kids ages 10+ because of the intense tragedy that occurs. Kids and adults who like magic, adventures, and mythical creatures will love this book. Casey overall loved Casters of Doovik, and would give it 4.5 stars. Were it not for some confusion with time frame in the beginning, and a huge, confusing cliffhanger at the end, he would have given it five stars. He hopes for a sequel so he can know more about the powers the casters have and what they can do with them. All her life, Meg has lived within Doovik’s walls—walls meant to keep the dangerous creatures outside from coming in. But when a curse drives her from Doovik, Meg and her friends must battle mythical monsters and follow clues to break the spell and get home. From the author of the Benotripia series, this thrilling fantasy will have your heart racing! McKenzie Wagner is 14 years old and already has four published books under her belt. An ambitious girl who began writing at the age of seven, McKenzie is best known for “The Magic Meadow and the Golden Locket,” published at age 10, and the Benotripia trilogy, the last book being released when she was 13. Inspiring thousands of kids to follow their dreams, McKenzie has visited several elementary schools across the state of Utah and done numerous book signings in Costco, Barnes & Noble, and Hasting stores. When she isn’t writing, McKenzie spends her time reading, acting, singing, hoping Peter Pan will take her to Neverland, and adding to her collection/army of stuffed animals.